For large customers with complex landscape and for service providers managing the landscape of multiple customers, it is very important to optimally manage the downtimes of the systems as downtimes on productive systems could incur huge costs. Service Availability Management (SAM) application in Focused Run for SAP Solution Manager (FRUN) helps customers to maintain service level agreements regarding the availability and thresholds. High availability systems need to be available 24 * 7 and 365 days in the year. The availability thresholds of these systems are usually 99.9 % which evaluates to only 43 minutes of allowed downtime for a month. This means the administrators should monitor the downtimes of such systems very closely. With the new feature pack FP3.0, FRUN has introduced a new application “System Down Monitor“ to help our administrators in the above situation. System Down Monitor gives the administrators a snapshot of all the systems that are currently not available either due to planned downtime or unplanned alert. Additionally, it gives them information regarding the current availability of Service Level Agreement (SLA). This helps them to prioritize and work on systems that are already nearing SLA breach. In this blog, I have provided a sneak peek to System Down Monitor and how it can be used effectively by the system administrators. When a service provider or the IT team of a large company provisions a system in the landscape, they should use the SAM application to maintain the Availability times, Contractual Maintenance Periods(CMP) and SLA. High availability systems like “FINANCE“ should have the least downtimes. The availability may be 99.5% and CMPs may be allowed for only 1 hour in a month. Once the service is defined for the system, outages will automatically be recorded on the system from availability alerts or Planned Downtimes. We can see the same in the Outage overview of the SAM application. Though it is useful, we get to know the remaining availability only after the Alert/Planned Downtime is over. For system administrators managing large landscape they need the availability information real-time to help them prioritize their work. The system which is in or nearing SLA breach is the highest priority for them and should be brought back as soon as possible. The System Down Monitor is the new application developed to help the administrators in such cases. The System Down Monitor gives a view of all the systems in the landscape which are down. Additionally, it provides information about the current availability of the system. This takes into the account the current downtime i.e. effect on availability because of current alert. The System Down Monitor view is part of System Monitoring and SAM applications. As seen in the picture, the system which has a definition in the SAM application will show the SLA information whereas a system without a definition will not have that. On checking the System Down Monitor, the administrator can see what is the current availability of the systems in the landscape. He can decide the priority of the systems based on time remaining for the SLA breach. In the System Down Monitor, the the current SLA is calculated based on the current ongoing availability alert for the system. So, it always gives the administrator a real-time view in contrast to the SAM application. 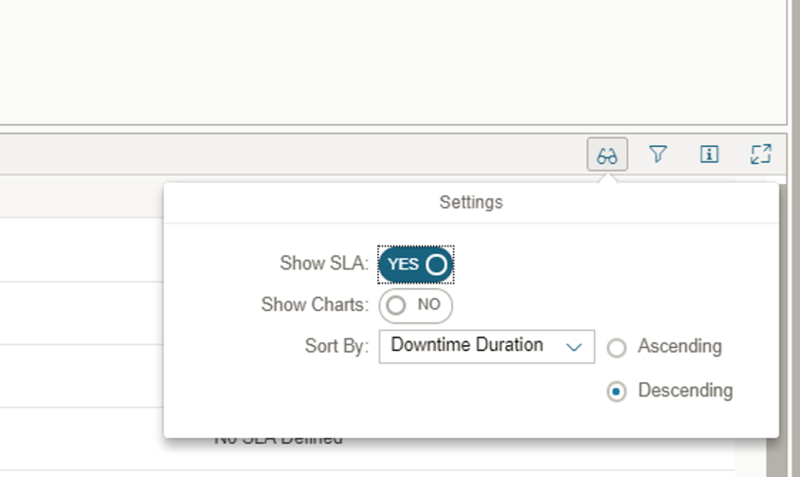 If a planned downtime is scheduled on the system, then that would take priority over an availability alert and would be shown. The duration and availability charts are not visible by default but can be seen by using the Settings in the toolbar. Hope this blog provides the customers with an insight to the new application System Down Monitor and it adds value to the day to day monitoring of the landscape.